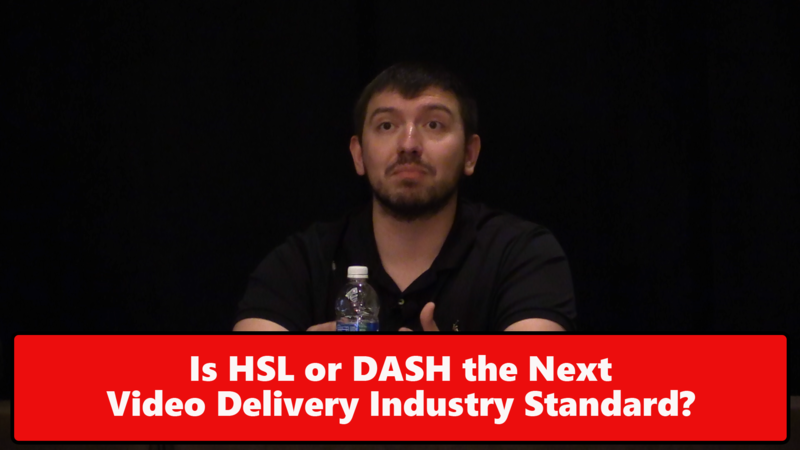 Video: Is HLS or DASH the Next Video Delivery Standard? Is HLS the next industry-standard protocol for streaming delivery everywhere? Or do DRM issues limit its appeal? In this excerpt from their Streaming Media West 2016 panel, experts from Viacom, Comcast, Akamai, and Microsoft debate the issues surrounding HLS and MPEG-DASH in the current and emerging streaming delivery landscape. Jeff Tapper: HLS as a standard is perfectly reasonable. The reality is that to stream content to everywhere today, HLS just made a lot of sense for us as a company. The HLS.JS project is the basis of all of our web players today. It does a really nice job of transmuxing the transport stream files into fragments of MP4, which can be handed off to the media source extensions, and it just works well. Rustam Khashimkhodjaev: HLS, I completely agree is a well-defined standard. It's been used for quite some time now. The problem, though, is once you run into the digital rights management pieces, and at least in certain circumstances right now when using HLS.JS you really can't get around the DRM piece. It depends on whether you have content that needs to be protected or you don't have content. If you don't have contact protection issues, HLS.JS is a good way to go. Jeff Tapper: Owning all of our own content, we're able to get away with secure delivery with AES128 encryption and SSL of all the streams, and that has been deemed good enough for what we've been doing for now. Will Law: I back up what Jeff and what he's saying. It's working for Viacom, but it's working for their particular situation. You're not carrying Hollywood-based content that has DRM rights. Will Law: If anything, the requirements for DRM are going to accelerate. DRM is a fractured landscape today, so supporting common encryption is about the most efficient way we have of dealing with that encryption. Jeff Tapper: With some of our kids and family brands, we deal with a lot of older devices. You know, it is with iOS 10 is where CMAF HLS is first supported. We deal with a lot of iOS 7, iOS 8 devices, so that's not going to be a possibility for us. Iraj Sodogar: Of course, lots of people know how to work with HLS, they have workflows for it, but there are new use cases--for instance, for low-latency live delivery that I believe Impact DASH can do better just because of the design. Things like efficient manifest update that uses event rather than pulling the manifest every time when you do live streaming and you don't know how long the session will go on. CMAF brings basically some of those features, including common encryption, including the event message box that allows basically signaling the device to update the manifest to HLS. I think it would be interesting to see how the market's going to evolve when Apple devices become updated with iOS 10. Industry using the CMAF, what that manifest format might be used, and which one will conduct dominance. I think the new use cases will be the test, the domain, the area that basically defines whether DASH will be used more or HLS. Bitmovin surveyed respondents across the globe, finding the lowest DASH usage in the U.S. and the highest in APAC and LATAM. Video: Can MPEG-DASH and HLS Coexist in the Current Video Delivery Ecosystem? Akamai's Will Law discusses the current codec climate, the pros and cons of HLS and DASH features and deployments, and the advent of CMAF. Who is adopting DASH and who is sticking with HLS, and why? Execs from Viacom, Sinclair, Float Left, and Brightcove discuss the current and coming state of DASH.